In 2012, Eberhard van der Laan enthusiastically embraced the idea of ​​establishing the Amsterdam Canal District. In the memory of Eberhard van der Laan, we like to join the initiative of the Eberhard cookie. This cookie is named after the beloved former mayor Eberhard van der Laan. 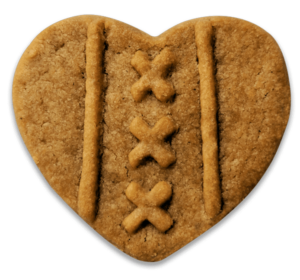 Like him, this heart-shaped cookies symbolize the connection between the people of Amsterdam and their love for the beautiful capital. The Eberhardje is a delicious cream butter biscuit with vanilla. Part of the proceeds of the cookies will go to the Eberhard foundation for Amsterdam.